This iExpression computes the rotation of a wheel based on the movement of the layer. This can be used to rotate the wheels or a car or any other kinds of wheels that roll on the ground. If the wheel only moves along a straight line and does not change its size over time, you can use the faster iExpression 'Rotating Wheel Linear Motion' instead. Choose if the rotation should be computed according to the movement of the layer itself or according to the movement of another point. link here the other point, to whose movment the according rotation should be computed. if the ground itself moves relative to the composition, use this option. is the name or index of the ground layer relative to which the wheel should rotate. Specifies whether die diameter is given in composition or in layer space. Example: Say the wheel is a solid of size 100 pixels and is scaled to 200%. With the option 'layer coordinates' you should set the diameter to 100 but with the option 'comp coordinates' you should set it to 200, since from the comp's perspective, the solid has a size of 200 pixels. Activate this option if the wheel rotates in the wrong direction. This may happen when the ground is above the wheel instead of below it. Increasing this value makes the computation faster but less accurate. 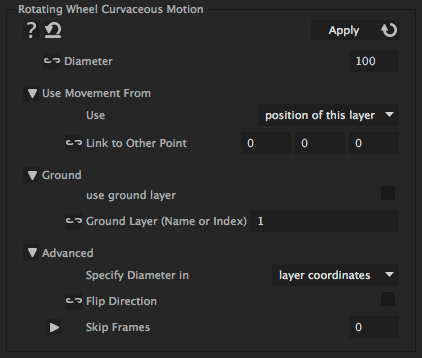 For a value of 5, the iExpression calculates the motion path only on every 6th frame and assumes that the wheel travels from one such point to the next in a straight line.